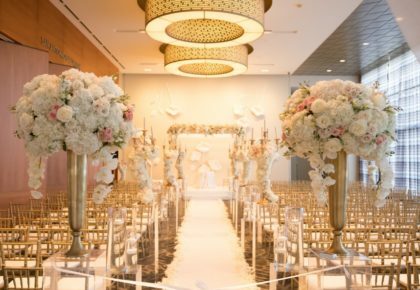 Enjoy the Art of Weddings & Events at The Modern as they showcase food and design that will inspire you THIS Thursday, February 24 from 6:30 to 9 p.m.! 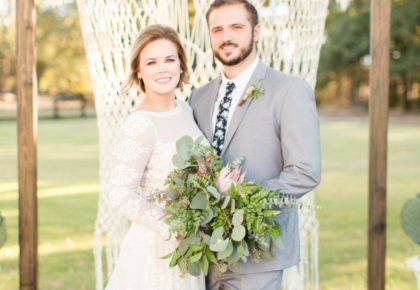 Check out the latest in luxury and meet the Brides of North Texas Team. This event is complimentary, business casual attire is required. 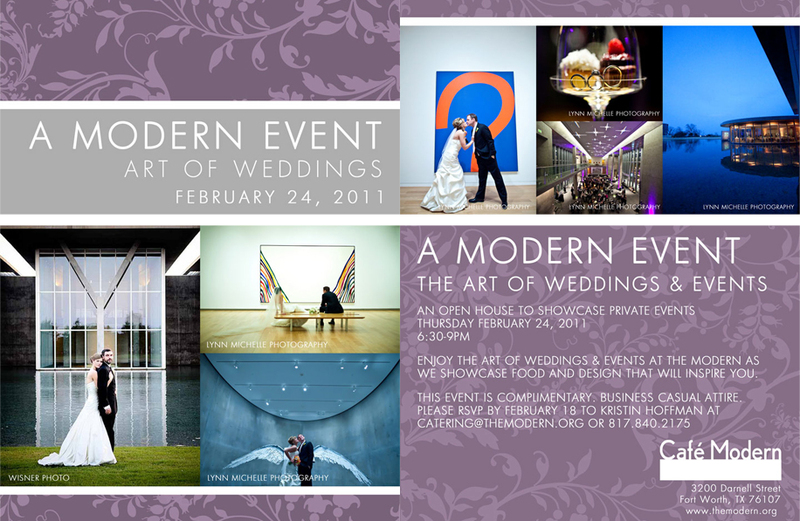 Please RSVP by February 18 to Kristin Hoffman at catering@themodern.org or 817.840.2175. Stop by and check out the amazing local vendors in Greenville on Saturday, February 26, from 10 am to 4 pm at the Wedding Expo. There will be door prizes and giveaways, and don’t forget to pick up a complimentary copy of the new Spring/Summer 2011 issue of Brides of North Texas. Stop by Stardust Celebrations in Plano this weekend to see the latest couture styles from Matthew Christopher. Call 972.781.1619 for an appointment for the Matthew Christopher trunk show this weekend, February 25-27. For more information click here. For the eco-conscious bride, you won’t want to miss the Adele Wechsler trunk show at Bliss Bridal Salon. The trunk show is this weekend, February 26-27. Call for your appointment: 817.332.4696. All of Adele’s Eco-Couture dresses are made of organic hemp and silk and vegetable dyed silks! With the popularity of “Green Weddings” gaining momentum, Adele Wechsler is unquestionably a trend-setter with this breezy, windswept and free flowing collection of beautiful gowns! You won’t want to miss out! Historic Old Town Lewisville will be hopping this weekend! 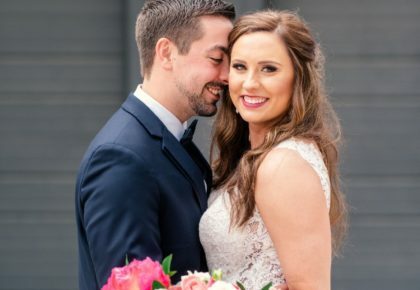 The I Do I Do…Destination Wedding Show will be going on throughout Downtown Lewisville. Stop by to check out the latest in wedding trends and meet some of DFW’s finest wedding professionals! Get your complimentary copy of Brides of North Texas Spring/Summer 2011 issue while you’re there. It’s sure to be a blast that you can’t miss! The Bridal Salon at Stanley Korshak is hosting a Romona Keveza trunk show this weekend, February 25-26. Call 214.871.3611 for your appointment. Prepare to be dazzled by this incredible couture collection. Needle in a Haystack is offering amazing savings on Arabella Papers, Crane & Co., William Arthur and Luscious Verde wedding stationery right now! If you’re looking to make a statement with lovely invites and couture stationery suites, contact Needle in a Haystack right away to browse these incredible collections! Don’t miss your chance to check out one of the hippest venues in the DFW area! The NYLO Dallas/Las Colinas Hotel will be hosting a fabulous bridal show Sunday, February 27! Be sure to swing by between noon and 4 p.m. to meet with local vendors and to check out NYLO’s exceptional space! Pick up a complimentary copy of the new Spring/Summer issue while you’re there. Cheers! Frisco Heritage Center presents their first annual Bridal Show, Sunday, March 6, from 1 pm to 5 pm! 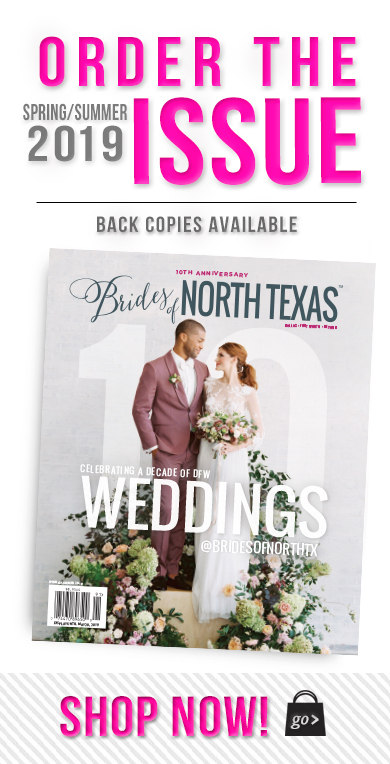 Check out amazing local wedding vendors and be sure to pick up your complimentary copy of the new Spring/Summer 2011 issue of Brides of North Texas. For more information, check out their Web site. The Fort Worth Club presents A Fete for All Seasons. Featuring elegant event decor, stylish table setting and delectable menus. Monday, March 7, 6pm-8pm in the evening. Enjoy hors d’ouevres and cocktails. Reserve your place today by contacting Christina Tran, ctran@fortworthclub.com. Admission for the event is free with an RSVP or $10 at the door. Business casual attire is recommended. If you’re excited about the new trends for 2011 as much as we are, you’ve got to put this fashionable event on your radar! Brides of North Texas is thrilled to be one of the sponsors for Tablescapes and Trends at City Club of Fort Worth Thursday, March 3, 6-8:30pm!! Take this opportunity to walk the catwalk and scope out the latest trends in weddings! Hang out with wedding experts and enjoy City Club’s fantastic food + drink! RSVP by emailing weddings@cityclubfw.com or call 817.878.4051! RSVP Required to attend. City Club Fort Worth is located at 301 Commerce Street Fort Worth, TX 76102. There will be complimentary parking available at 200 Block of Commerce in Sundance Square’s Parking Garage! Can’t wait to see you there! Ciao!